Recently I have been pondering about the “Fully Balanced Symmetrical VAS” stage. This is a natural post-traumatic consequence of hitting the problem of the “undefined quiescent current”, as first encountered in some advanced schematic originating from a book by Randy Sloan, “High Power Audio Amplifier Construction Manual”, Fig. 11.14). 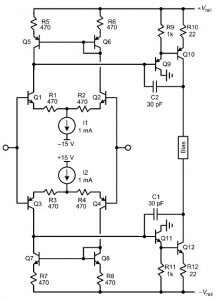 The “undefined quiescent current” has been described in some greater detail in a book by Bob Cordell: “Designing Audio Power Amplifiers”. In other words, it shall fry your VAS transistors. But, as he further suggests in the description of the solution: “… The price being paid here is a slight reduction in the gain of the input stage. It is differentially loaded by (a resistor) R14 instead with a very high intermediate impedance set by transistor betas. ….”. And this is the point where I started scratching my head. This novel approach to a VAS stage, an approach based on a differential stage, independent current sources, and a current mirror … I like it. Really. Gee ! If only it could be possible to make this into a Fully Balanced, Symetrical VAS, and fully mirrored, at that. So I took my note pad and starting drawing some nonsense. At fist, I tried to imagine, what a “vertically mirrored” version of the “Differential pair VAS with current mirror load” would look like. Then I put both of these stages adjacent to another on the same piece of paper. The bias generators I have depicted as a battery symbol, lacking a more appropriate symbol in my libraries. But anyways, the question would be very valid. Indeed, if this is to be a fully vertically mirrored, vertically complementary, fully balanced symmetrical differential VAS stage, then obviously, I need to “find a way” to get rid of one of those batteries, and instead of the “two” of them, merge the drawings in some sneaky fashion so as to obtain one such bias generator. Each “half” VAS section is basically comprised of two current sources/drains, with a smart differential stage, a cascode at the mid-level (conveying the current representative of the differential V_Ref voltage to the “other side”, ie to the opposite PS rail side), and a current mirror from the other PS rail side. I see two “independent” Bias generators, whereby each of the two is connected to one of the differential amplifier stage output current paths, and specifically to the one associated with the controlling “V_Swing” input signal, from the one side, and with a current mirror tap from the “other side”. I basically have two “current mirror” tappings, and two differential amplifier (V_Swing controlled) tappings. And one bias generator too many. a). One of the bias generators is deleted. b). 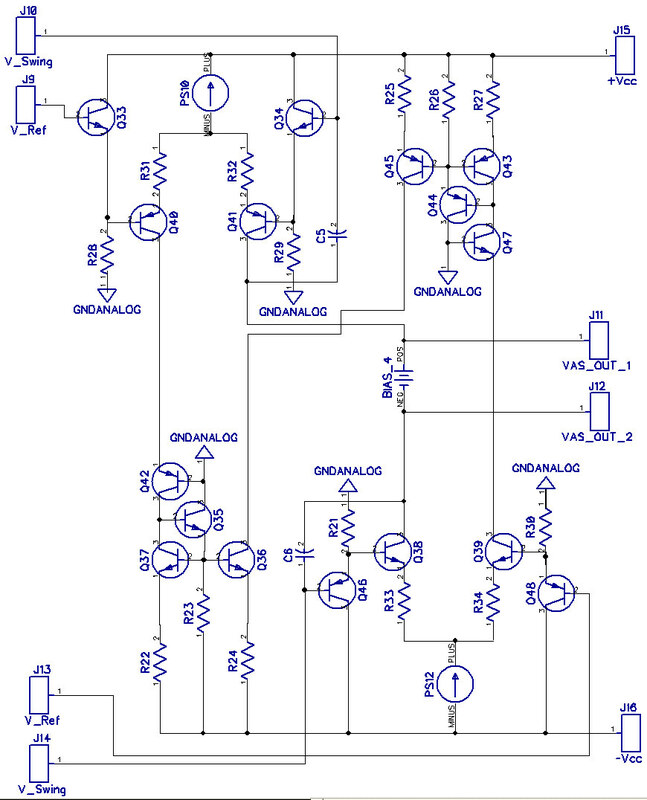 The “remaining” bias generator is the one that is connected to one of the current outputs of the differential amplifier stage (the output that resembles the current associated with the V_Swing input pin signal) from the ONE side …. and with EXACTLY the same, mirrored entity, from the “OTHER” side”. 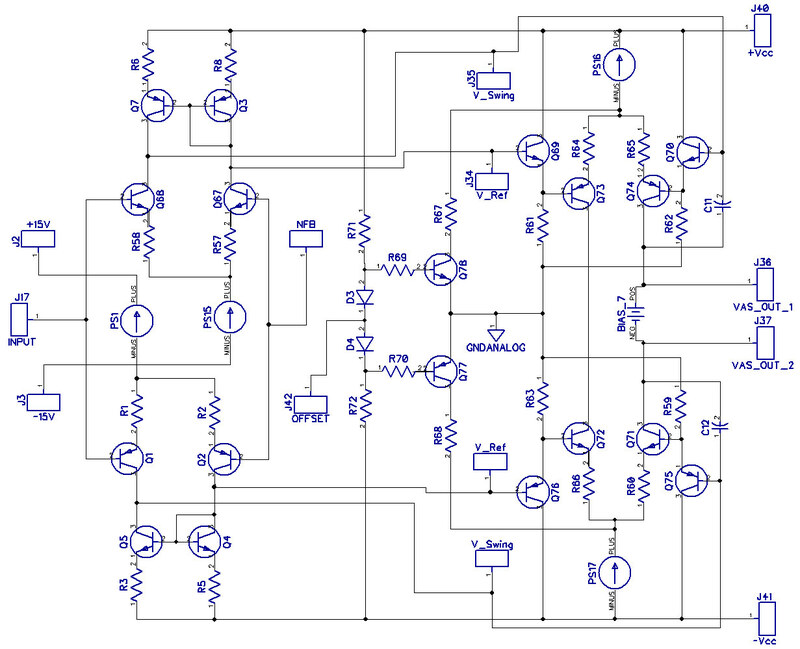 In other words, the other side of the Bias generator is now ALSO connected to one of the current outputs of a differential amplifier stage (the output that resembles the current associated with the V_Swing input pin signal) from the OTHER side. 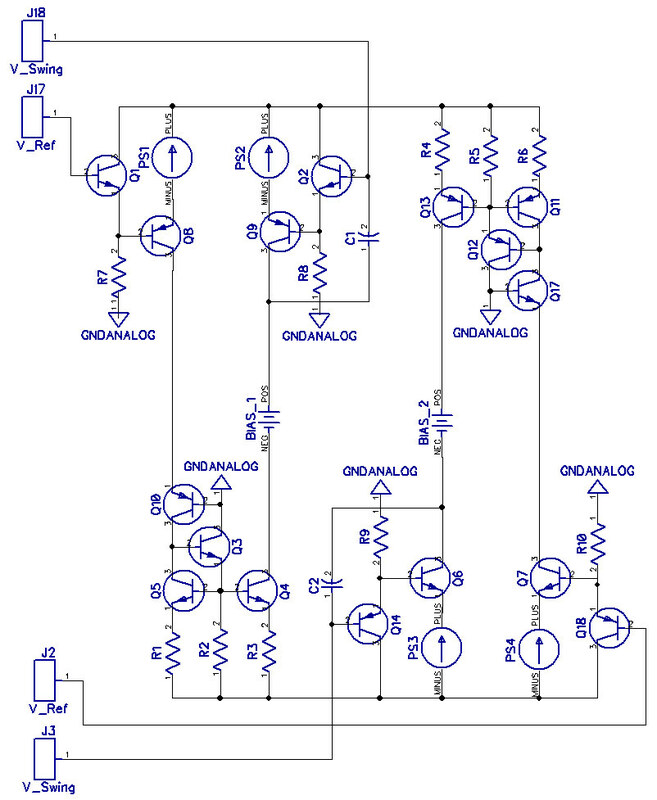 Here I am referring to the differential amplifier associated with the OTHER rail voltage. Ok. So we got two tappings connected. We are left with the two hanging taps of the Current mirrors themselves. So, lets connect the two and see what happens. 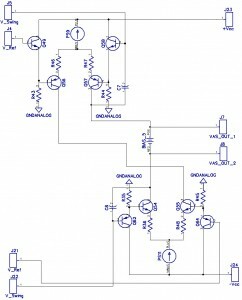 We get the schematic as drawn above. We now see that the “upper path” V_Swing signal controls the amount of current flow going into the Bias generator from the “top” side. We also see that the “lower path” V_Swing signal controls the amount of current flow being sunk from the Bias generator from the “bottom” side. Hmmm… looks fishy. Especially in the context of those “independent” current sources. It seems that we are in for a problem due to one current source “pushing” a current down from above, and then an independent current source “pulling” current from below of the Bias generator. Not good. 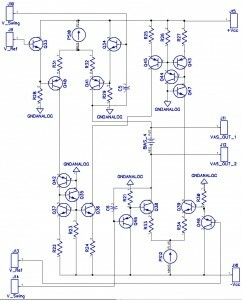 Looks like trouble, voltage instability, oscillations, some sort of fighting against each other, or whatever. And besides, I see an independent problem: Look at that path / network associated with the V_Ref voltages. Not good. 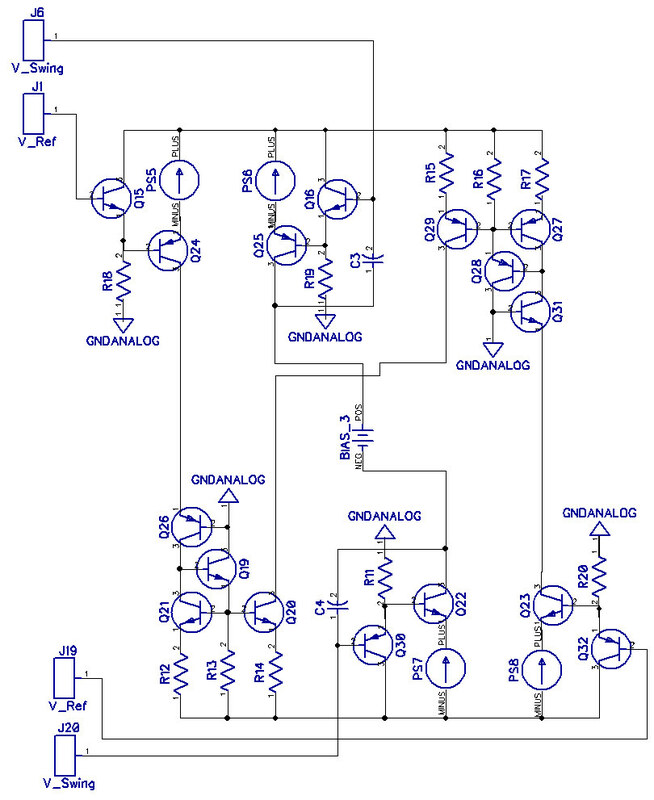 The upper V_Ref voltage controlling current flow from a current source (???!!!) into a current mirror down below, and then this mirrors a current into yet another current mirror up above, which is connected to YET another current drain, which is controled (???!!!) by the other V_Ref voltage. Definitely trouble ahead. We simply have much too many current sources within this setup. So let us reduce their count to only two. A shared current source/drain for each of the differential amplifier stages, the top one and the bottom one. Obviously, some degeneration resistors for the emitters of the differential stages would now apply. Now, when I look at this setup, I get this gut feeling that it just might actually work. Not spectacular, but work. 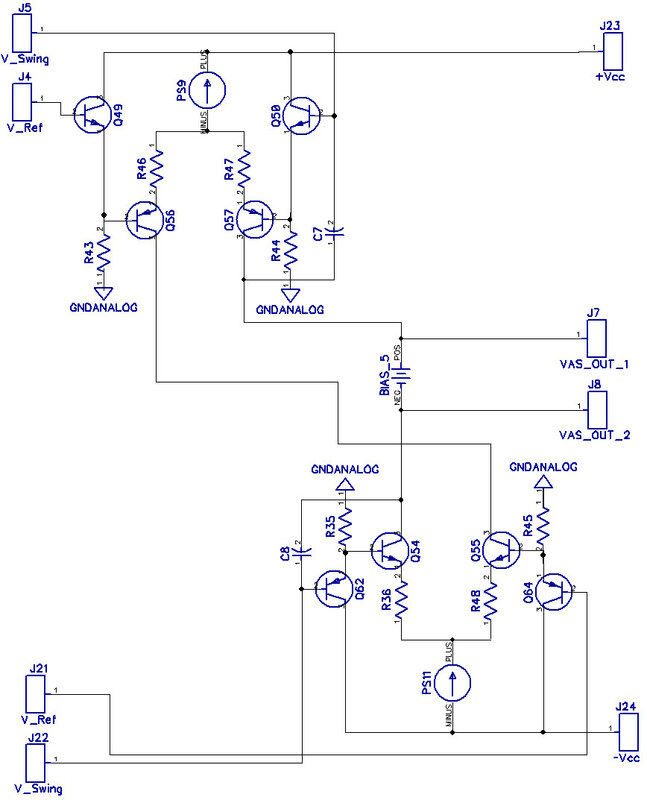 The Bias generator is placed in the middle between two mirrored output branches of the respective top and bottom differential amplifier stages. Specifically, into the branch that is controlled by the respective “V_Swing” differential input signal. Each respective differential amplifier is sitting upon a common current source/drain, so whatever “current imbalance” being a result of whatever is going on from the top-side-pin of the bias generator and the “bottom-side-pin” of the bias generator, now at least has a “chance” to be diverted via the “other” branch of its respective differential amplifier stage. Ok. 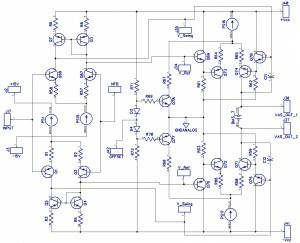 So let us see what is happening to those currents from the “other” differential branch of each respective differential amplifier. Basically, each such current is “controlled” by the respective (upper or lower) V_Ref signal, and then is routed to the “opposing rail” current mirror”, where it is mirrored and confronted with the “other” current mirror. This setup could actually work, with the two current mirrors fighting out some average quiescent current consensus …. albeit with one major caveat ..
Why the heck to we need these two current mirrors at all now? A total mess and exercise at redundancy. Let us just junk them altogether, and save ourselves some transistors and overhead. The white empty “holes” is the blank space after deleting the current mirrors. The “opposite” branches of the differential amplifiers have now simply been connected together. This is the “organized” version of the graphical chaos from the picture above. 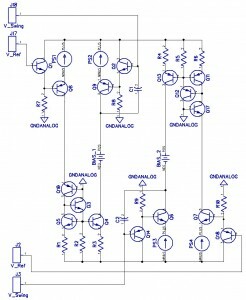 Electrically, it is the same circuit. One thing remains for sure: At no point and at no circumstances can the current flowing through the VAS transistors actually destroy them. The VAS transistor current can simply not be higher as that programmed by the pair of complementary Current Source and Drain. 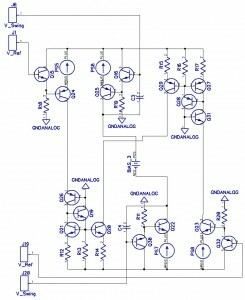 What about the DC voltage offset at the output of the stage ? I have a feeling that this could be influenced by fine tuning of the current programming of one of the current sources/drains. 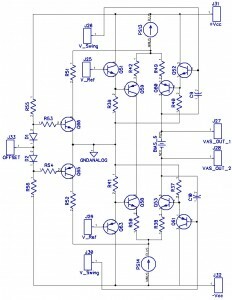 Maybe a small servo to facilitate automatic DC offset nulling? Or maybe just leave it to be taken care of by the global (DC-path) feedback loop? You tell me. 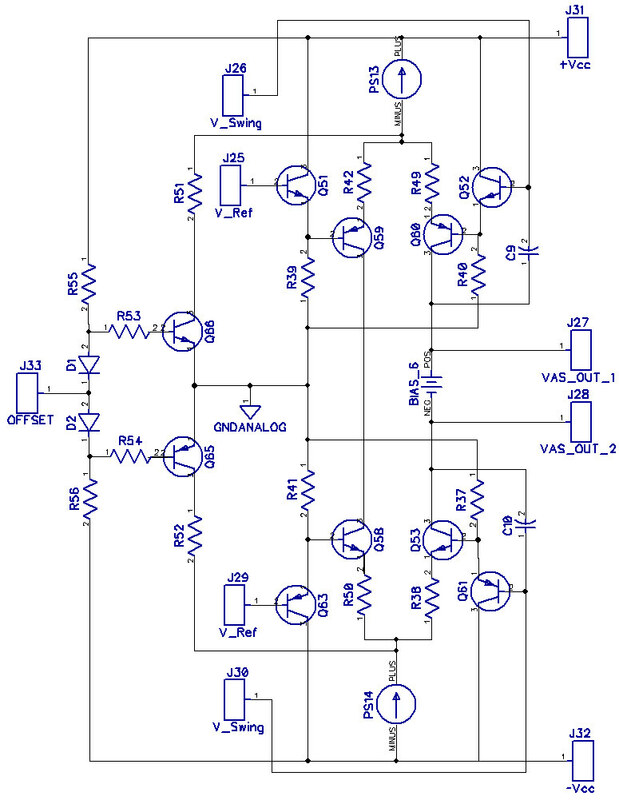 Anyways, I have a good feeling about this circuit. And I think that it should work. What to YOU think ? Would be grateful for your educated feedback on this matter. After all, these are not tubes, so any and all comments, critique or further suggestions, would be kindly appreciated. 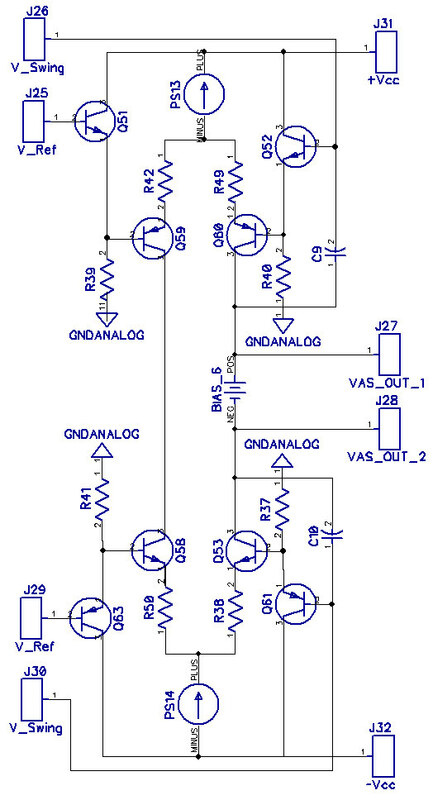 The intention is to provide a signal to the “Offset” input pin, provide it with some voltage, a voltage as referenced to ground, one which would be a fair representation of the DC unbalance at the output of the amplifier. Obviously, this signal would need to be the output of some hefty low pass filtering, with a time constant of probably 1 Hz or slightly less. Any amplifier output signal of a higher frequency than 1 Hz would be treated as the “musical content” and rendered insignificant. It would be treated by the filter as some heavy bass. On the other hand, any signal of a lower frequency than the stated 1 Hz, (i.e. 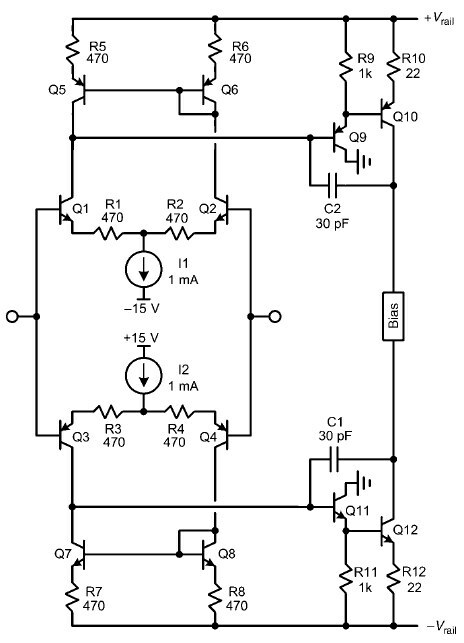 DC or almost DC) would render a “correction voltage” to the Offest pin, one that would influence the top side current sourcing and the bottom side current draining, in such a fashion that the DC offsets at VAS_OUT_1 and VAS_OUT_2 would result in the output of the amplifier positioned at exactly zero volts DC. I hope it will work. Other suggestions? 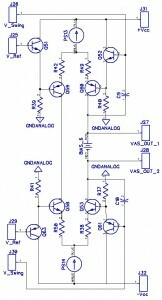 How would this VMD FBS VAS look like in connection with the FBS Input stage ?